RIO DE JANEIRO – On almost every street in Rio de Janeiro restaurant signs that say “comida por quilo”, (food per kilogram) indicating that food is sold by the kilo regardless of its kind, arouse curiosity in many first time visitors more used to eating by the menu rather than by weight. 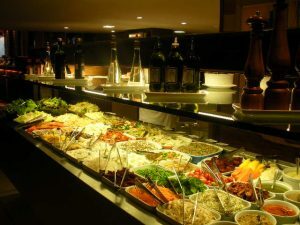 The salad bar at Frontera in Leblon, photo by Sibel Tinar. Even more frequently encountered in commercial areas in which they compete by lowering the prices to attract more people at lunchtime, these restaurants offer a large variety of dishes, both Brazilian and exotic. They are usually no-frills, always self-service places with a large buffet, where customers pay after getting their full plate weighed and the weight of the empty plate subtracted. It is an ideal option for those who want to sample different foods without the need to commit to one particular dish, and pay only for what they choose to take, as well as getting the vegetable fix often overlooked in typical Brazilian restaurants where meat and rice is king. This is not to say that the food is cheaper in all “por kilos”, and more often than not it may be more expensive. Since all that matters is the weight of the plate, high-quality meats such as filet mignon are the same price as plain white rice, so it is up to the consumer whether eating by the kilo means savings or not, as it is very possible to end up with a plate of rice and beans that costs close to R$30. Price also depends largely on the location of the restaurant, as the price of one kilogram (2.2 lbs) of food ranges widely, from as little as R$16 to as much as R$60 across the city. Usually priced per 100 grams, it is possible to find modest yet decent offerings in Centro, where the competition is greater, that only charge R$2 per 100g, and even as low as R$1.59 per 100g if you go before or after the lunch rush-hour of noon-2pm. On the other hand, it is rare to find food priced lower than R$4/100g in the more affluent neighborhoods such as Ipanema and Leblon. It should also be noted that some restaurants have a higher price for sushi and dessert, and beverages are extra at all places. Cria da Terra, the new organic restaurant in Ipanema, photo by Sibel Tinar. 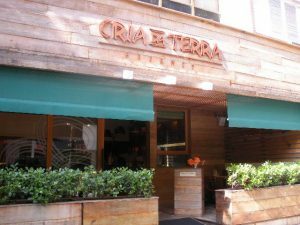 Due to the range of options they offer, the “por kilo” restaurants can be a haven for vegetarians who usually have limited options to eat out in meat-loving Brazil, such as Cria da Terra in Ipanema (Rua Anibal de Mendonça, 132). Newly opened, it offers a wide variety of fruits and vegetable dishes made with extremely fresh, organic ingredients, balancing their tasty cold and raw fare with some healthy hot vegetable, chicken and seafood dishes. Having recently inaugurated its new restaurant in Leblon, “por kilo” chain Frontera (Avenida Ataulfo de Paiva, 630) offers varied, healthy choices of consistently good food in its five locations in Rio, within a cozy yet sophisticated atmosphere. Food options range from traditional Brazilian dishes such as feijão tropeiro to duck with ginger sauce and seafood stew. In Flamengo, simplicity with good-quality ingredients is the key to the success of the popular restaurant Oklahoma (Rua Senador Vergueiro, 35 Loja C). It offers a pasta bar, where they will create your chosen dish in front of you, in addition to good seafood, a solid churrasco with excellent steak, and a great selection of ultra-sweet desserts. Friendly staff and nice touches like free herb breads to nibble on while waiting for your drinks make it well worth seeking out if you are in the neighborhood; however timing can be everything, since it is packed at lunchtimes and on Sundays. In the busy business district of Centro, Pampa Grill (Avenida Almirante Barroso, 90) stands out as one of the best “por kilo” restaurant options. With its thirty salad and sixty hot dish options, Pampa Grill prides itself on quality and variety including local, traditional Brazilian, and international cuisines. Thursdays are cozido, Fridays are feijoada days in this restaurant, which also boasts a large sushi bar of various Japanese delicacies, and even turns into a trendy club at nighttime. Primarily a churrascaria (barbecue house), they offer almost all different kinds and cuts of meat available in Brazil, and have a rodízio-style (all-you-can-eat) option as well, for those feeling ultra-hungry. The ‘por kilo’ restaurant concept is brilliant and is my choice of restaurant every time – I love the transparency: no more waiting for some over-priced, lame or dreadful concoction to eventually emerge from some kitchen you’re not allowed to see, can only wonder about, and almost certainly wouldn’t want to work in! ‘Por kilo’ food HAS to be good, since you see it for yourself before you choose. It’s also the only type of restaurant where you can actually ‘design’ your own meal, giving more control over your diet than typical restaurant menus offer. The choice of dishes is getting more and more sophisticated, too. Can’t wait for my next 800g of great value.